Bocce season has finally began – my life once again feels complete. 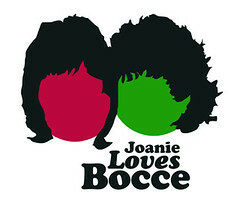 The kick-off to the Joanie Loves Bocce season was last Thursday. The food theme: Southern Aristocracy. We had pulled pork sandwhiches, black-eyed peas, KFC. I made Tailgate Coleslaw with Bacon and Candied Walnuts – needless to say we ate well. Unfortunately, our playing wasn’t as successful since we only won 1 out of 3 games. But, we have 24 more weeks of Bocce bliss and this makes me smile. Thursday night didn’t end bocce playing for a few of us. Tony T., Helen Jane, James, Britt and I played in the St. Helena Chamber of Comerce fundraiser on Friday. Six games – undefeated – we took the day and have the GOLD medals to prove it! Redemption!